Paper & Pattern is our collaboration with clothing company Ace & Jig. 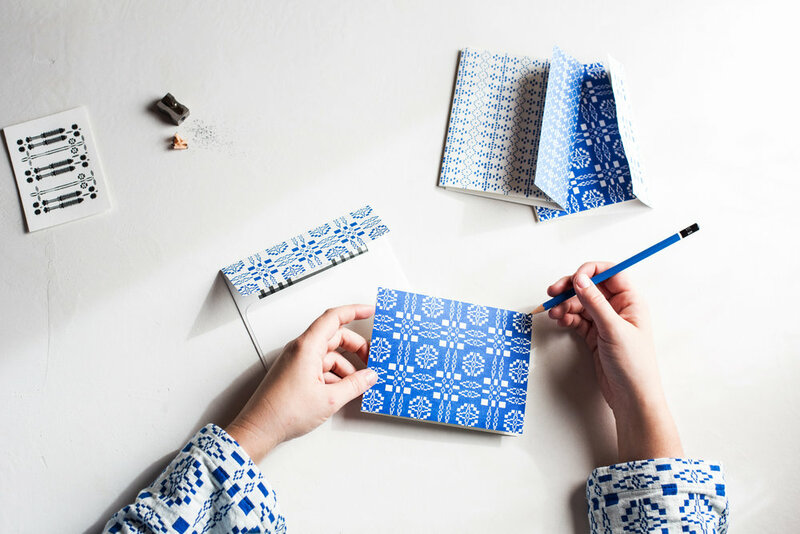 The collection includes 6 cards, envelopes, and envelope liners that are each inspired by one of Ace & Jig's textile patterns. Ace & Jig are known not just for the clothing they design but for inspiring its wearers to get creative with pattern, to take ownership of their look, and to have fun! The concept for this collaboration came about when we decided we wanted to come up with a line of cards that we could mix and match. We knew we wanted this line to focus on pattern and have a limited color palette. Immediately the patterns of Ace & Jig came into our minds. We have long been admirers (or obsessive fan girls) of the brand and covet our own Ace & Jig wardrobe pieces so when we had all of our fingers and toes crossed that Cary and Jenna of A&J would agree to take part when we asked if we could deconstruct some of their patterns and adapt them to letterpress. The entire team at Ace & Jig was a dream to work with, and we are so proud of this labor of love. We hope you enjoy this line as much as we do! Featured above are the Cardiff and Dutch Blue cards. Each card is printed on 100% cotton paper and was run through our presses by hand. If you want to see what the patterns look like on a piece of clothing you can check out the cardiff here. To begin the collaboration, I asked Cary & Jenna to send me fabric swatches of each of their patterns. I then made illustrations of my favorite patterns and played around with how they all might fit together. Because these patterns are woven pieces of fabric I had to figure out (through a lot of trial and error) how I was going to translate their beauty onto paper. I wanted these cards to feel as tactile and tangible as those fabrics. (Pictured Above: the Tribe card nestled into the tribe envelope).